This calculator brings real-world math concepts to life. It has built-in Computer Algebra System (CAS) capabilities plus all the functions of the TI-Nspire family of calculators. A menu-driven interface and built-in document structure enable faster, stronger connections between representations of graphs, equations, data, and verbal explanations. 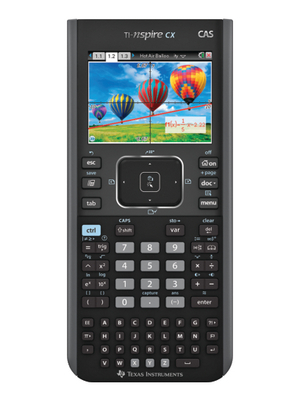 The full-color display projects high-resolution digital images and even your own photos with math and science functions. Users view color-coded 3D graphs. Along with standard numerical capabilities, this model also explores symbolic algebra and calculus equations. The handheld model has a rechargeable battery, which lasts up to two weeks on one charge with normal use. Ordering information: The Teacher Pack includes a docking station for recharging 10 units, 10 USB cables, 5 unit-to-unit cables, a manual, and a free, 90-day trial of Nspire and CAS software.